How to convert HTML to PDF in ASP.NET? 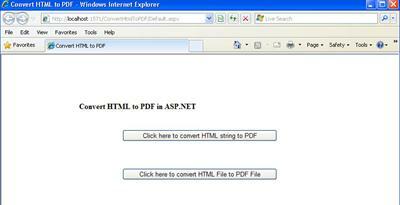 In this article I have explained in detail about how to convert html content to PDF content. In this article I convert PDF in two ways. 1) direct html text into PDF and also Read HTML file content and convert into PDF. I am using itextsharp dll for this requirement. &LT;asp:Button ID="btnExportPDF" runat="server" Text="Click here to convert HTML string to PDF"
Text="Click here to convert HTML File to PDF File" Width="320"
Here with I have attached source code of Convert HTML content to PDF example download and try to learn this concept. %PDF-1.4 %???? System.FormatException: Input string was not in a correct format. Nice and very relevent . Is very nice, but how can I convert the source codo to string? Nice, but how can I convert the source code to string? Nice, but how can I convert the sourse code to string??? "Unable to evaluate expression because the code is optimized or a native frame is on top of the call stack."